In recent times, we noticed a trend where partners and customers started to ask a lot more questions on the migration of Boomi based Integration to Point-to-Point(PTP) Integration in SAP SuccessFactors Employee Central Payroll(ECP). In this article, we attempted to cover the basic questions from Employee Central Payroll(ECP) Customers and Partners who were still using our Boomi based integration with either PASEIN add-on or EA-HR solution and want to migrate to Point-to-Point(PTP) integration. If you are already on Point-to-Point Integration, this blog is not probably relevant for you. Q:What is the Point-to-Point architecture in SAP SuccessFactors Employee Central Payroll (ECP)? Our first integration between the Employee Central and Employee Central Payroll system is based on Boomi middleware. In 2016 (1605 Release), we rolled out the second version of our integration which is the middleware-free Point-to-Point (PTP) integration. It offers a much closer integration between Employee Central and Employee Central Payroll. Q:Can I use the Employee central payroll Point-to-Point integration with employee central for all Employee Central – Employee Central Payroll integration scenarios? 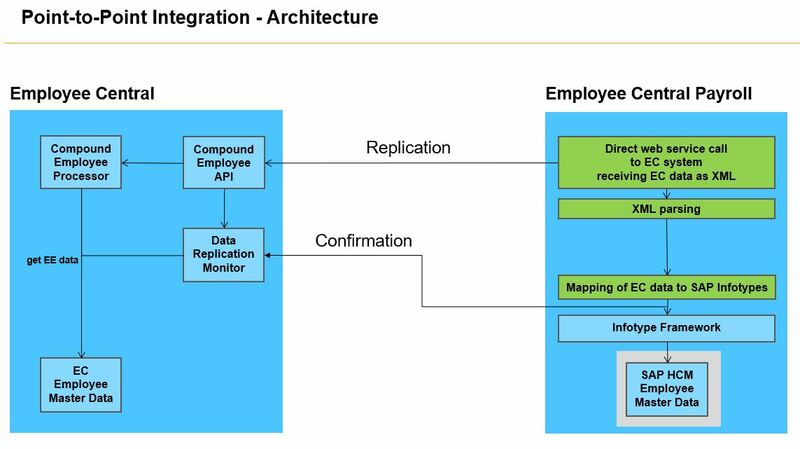 The Point-to-Point integration is only for Employee master data and Employee time data replication. Q:How does migrating from Boomi to Point-to-Point help me? All new features and integration scenarios are only available in the Point-to-Point integration because they require a tight coupling with all involved systems which is offered only in PTP. No middleware is needed because the PTP integration is a direct connection between Employee Central and Employee Central Payroll. Hence, Boomi maintenance is redundant. Robust architecture of the PTP integration allows faster and more efficient replication processes than in the Boomi integration. Tight coupling allows simpler data mapping, hassle-free error handling, and provides new extensibility options. Q:Do I need to change Employee Central for the PTP integration? No. You don’t need to change anything in Employee Central. Q:Do I need to change Employee Central Payroll for the PTP integration? Utility tools provided in PTP integration help you to migrate all customizing data, code mapping values and Employee Key mapping tables automatically from BOOMI-based integration to PTP integration. You only need to move BAdI implementation into new BAdI definitions manually in PTP integration. Boomi processes, including webservices in SOAMANAGER, must be stopped manually. Q:Are there any pre-requisites to start the migration? We recommend that you upgrade your system to the latest available HR Support Package. At least SP60 (latest available). Q:Will existing features in Boomi integration still be supported in PTP integration? As stated in our Payroll Service Catalog, all features are supported in PTP. In fact, more features are available in Employee Central Payroll, such as Complete Payroll tasks, Check tools, Fiori Payslip, Payroll results replication. Org management replication is not supported (PA-PD integration). Q:What if I use PD-Org integration which is out of scope? Using PD-Org is not in the scope of Employee Central Payroll. If you need to replicate job and position to the Org Assignment (0001) infotype, you can replicate it as described in the Checking and Creating Jobs and Positions Imported from Employee Central documentation. Q:Can I use both PTP and Boomi in parallel? No, you can’t. Only one integration is supported. Q:Can I use Boomi for Time and PTP for Employee master data replication? We recommend that you migrate both scenarios to PTP because you get additional countries for time replication in PTP, and timesheet which is only available in PTP. Q:Is there an official date for deprecation of Boomi integration? No. As of now there is no official date for deprecation of Boomi integration. However, as this is a usual process in the cloud environment, you can expect that this will also be done with this integration at some point because there has been a successor functionality available since 2016. Q:How much effort would be needed to migrate to PTP? This might differ based on the complexity of your payroll implementation. Major effort is on the testing part, that is, testing the implemented BAdIs, Employee and Time replication, Payslip and UI mashups. Q:What are the basic steps involved in PTP Migration? Q:Where can I find the documentation for the migration from Boomi to PTP? Note that you need an S-User ID to access the Employee Central Payroll documentation on the SAP Help Portal. Q:Will this migration affect any of my employee payroll data? This migration only changes the replication process and has no impact on employee payroll results.